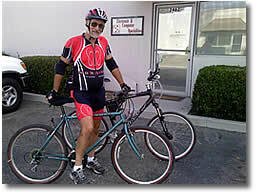 Get fit, get healthy, join us on our bicycle rides. Every Sunday at 8:30 am join us for a healthy trip on the Santa Ana River Trail. We start at the office and travel west to the river trail. Depending on the wind we will ride up the trail or down the trail. We gear the ride difficulty to the riders who are along. This is an ideal opportunity for the beginner and intermediate rider. The rides are from 7 to 40 miles depending on rider abilities and will last for about 2.5 hours. The ride begins promptly at 9am so you are encouraged to come early. Gel packs and energy drinks will be available for sale to anyone who has forgotten theirs. See you next Sunday ready to ride.